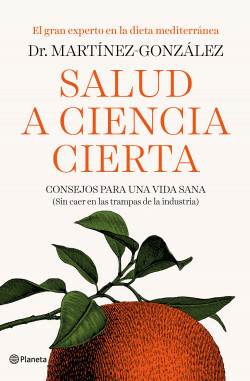 After having studied a population of 10,000 people for a decade, the largest study ever done on public health in Spain, Dr. Martínez-González presents in clear and accessible language medicine’s current knowledge about some of the problems that most worry people: weight control, the ideal diet, cholesterol, physical activity, blood pressure, health exams, alcohol consumption, tobacco addiction, stress and even happiness. -Why do people have trouble losing weight? What food should we immediately remove from our pantry? -How does industry influence our diet? -Why is white bread the worst food there is? -What is worse, sugar or fat? -Why is the food industry today worse than the tobacco industry 50 years ago? This is an informative book, but one which also brandishes the pen against the food industry - the new tobacco industry, in the author’s own words - and which shows how companies create false dietary needs in order to sell their surpluses, thus debilitating public health. Tips for a healthy life without falling into the traps of industry, as shared by one of today’s most prestigious doctors.